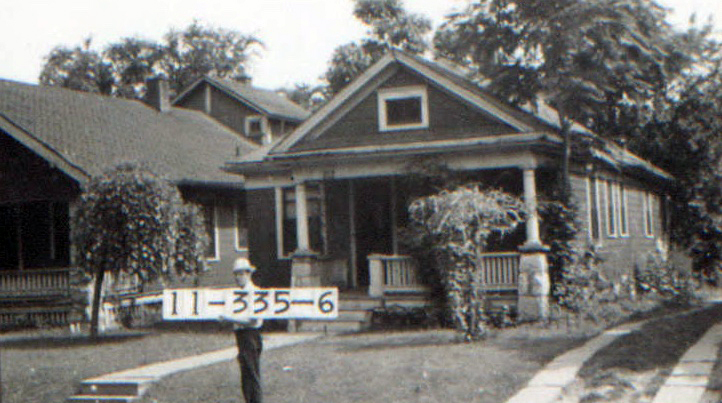 A Corbin Park home in 1940. See a slideshow of more homes in the neighborhood below. The history of Midtown Kansas City is full of tales of fortunes made and lost in real estate, but the Plaza Westport neighborhood’s past tells a different kind of story. A real estate developer and builder there, Will Corbin, is remembered for finding a way to help working class people in Kansas City afford the modern bungalows he was building in Corbin Park. 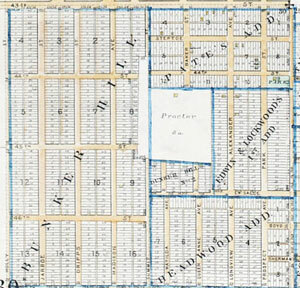 The Proctor farm in 1891, before development of Corbin Park began. 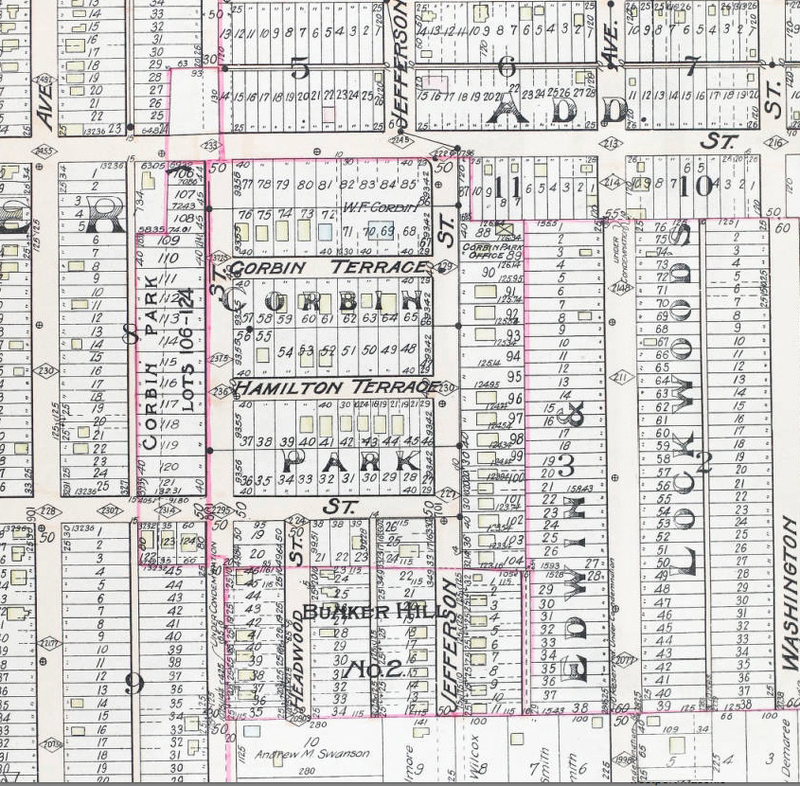 The Corbin Park area, the focus of today’s look back in history, was once the Proctor family farm, remaining undeveloped as early subdivisions like Bunker Hill were filled in around it. Charles Alfred Proctor came to Kansas City in 1869. He bought 12 acres of land in what was then Westport and built a home there. Although Proctor was trained and had worked as a physician, he gave up that profession and turned to real estate and raised fruit on the farm as a hobby. It was Proctor’s son, Charles O. Proctor, who began development of the Plaza Westport property. Charles O. had bought and sold land in Johnson County, Kansas, including the sale of 560 acres to the Strang Railroad Line for the Overland Park subdivision. In 1900, he built a home at 4343 Jefferson on land that had been on the family farm, and he also sold a tract to the Corbin Realty Company which became Corbin Park. The same area after development began, in 1907. As part of our Uncovering History Project, the Midtown KC Post is taking a look at the 1940 tax assessment photos of each block in Midtown. This week we’re focusing on the Corbin Park area, roughly from W. 44th to W. 45th, from Summit to Jefferson Streets. (Many people seem confused by the tax assessment photos, which all include a man holding a sign. Here’s the story behind them). Will Corbin’s name is not well-known in Midtown today, but back in 1908, the author of a three-volume book Kansas City, Missouri: The History and Its People 1898-1908 was full of praise for his contributions to the development of the city. The author, Carrie Westlake Whitney, was the librarian for the Kansas City Public Library and she wrote of Corbin in glowing terms in her book. Whitney writes that Corbin came to Kansas City in 1891 and worked in real estate. He built his own home at 1200 W. 39th. Whitney gives his company, the Corbin Realty Company, credit for doing something rare at that time. “Mr. Corbin and his business associates designed houses for working people, built them, and afterward sold the property on easy payments,” she wrote. 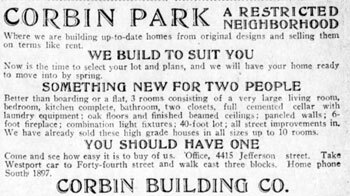 A 1909 Kansas City Star advertisement for Corbin Park. Corbin Park properties followed the same model after Corbin got involved. Whitney praised Corbin for the way he ran his company, serving as his own architect, hiring workers and supervising them himself without the aid of a contractor. She also pointed out that the forty homes that had been built were of the modern bungalow style, saying “some of the most comfortable, convenient and pleasant homes that have ever been constructed have been built in this style of architecture.” She called Corbin the pioneer of the bungalow style in Kansas City. “They are all of different design and are modern, attractive residences, some of them being numbered among the most beautiful homes of the city,” she said of the Corbin Park homes. Not stopping there with her glowing praise. Whitney goes on to call Corbin’s work of an important character and an element in the architectural adornment and improvement of Kansas City.